This featured new 3-Part webinar series is aimed to educate accountants and tax preparers on moving to paperless, the cloud and automating the tax preparation process. Cloud9 Real Time and SurePrep®, the creators of 1040SCAN tax document automation technology, have partnered to offer a real treat to accounting professionals: a free 3 part webinar Series. The first of the 3 webinars is centered on The Flexibility of Paper in a Cloud Environment on September 25, 2012 at 11am PDT. Hosts include David Wyle CPA, CEO of SurePrep®; and Robert Chandler, President of Cloud9 Real Time. All webinar registrants will receive Free trial software and Evaluation Guide (a $100 value) as well as a Complimentary whitepaper. SurePrep®’s 1040SCAN and SPbinder are leading tax document automation and paperless workpaper solutions. Used by more than half of the Top 100 Firms, SurePrep®’s solutions allow you to reduce preparation and review time by up to 50%. SurePrep® is also a leading provider of on-shore and off-shore tax prep outsourcing services. Cloud9 Real Time is an Accredited Managed Service Provider and Licensed Commercial Host by Intuit and Sage in the US and Canada, offering a customized and privately labeled all-in-one virtual office portal. With advanced hosting solutions you can have 24/7 access to all of your applications, Microsoft Office, Exchange services and data in one central location. On the forefront of cloud computing, Cloud9 Real Time offers QuickBooks hosting as well as custom virtual server creation. 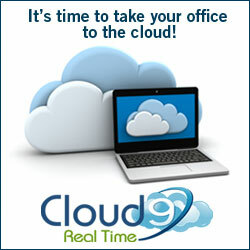 For more information on Cloud9 Real Time or SurePrep® please visit www.cloud9realtime.com and www.SurePrep®.com .